Whether your loved one goes out to parties or stays inside handing out candy on Halloween, he or she will need a creative costume. Below are four clever DIY costumes that Oshkosh home care providers recommend making with your loved one. Make fun of the old Christmas song “Silent Night” by dressing your loved one as an actual knight. Use lead sheet with a bird’s feather to make the helmet for protective armor. Spray paint on a non-slip safety mat to make the armor and sew the edges of the item to complete the look. Add a piece of duct tape over your loved one’s mouth to finish the Halloween costume and add a bit of humor to the holiday. Help your loved one feel young again by dressing him or her up as a high school senior. Get a pile of books, pick up a letterman jacket from a thrift store, and spike your loved one’s hair with a bit of gel to transform him or her into a different type of senior for the night. Additional props include a pair of high tops sneakers, some pom poms, or a basketball. Get people in the mood for KFC on Halloween by dressing your loved one as Colonel Sanders with this classic costume that will turn heads. The costume is easy to put together with a white suit, browline glasses, and a black string tie with formal attire from former decades. You can even visit a local KFC restaurant to obtain a red basket that your loved one can carry around and collect candy with on Halloween. Ladies can feel like royalty for the night by dressing up as The Queen of England. Have your loved one wear her best coat dress and a formal hat or crown to match. Accessories can also be worn such as a broach that can be worn on the chest and a pair of pearls worn around the neck. She can even use a small handbag and carry around a tea mug so that your loved one is more recognizable. 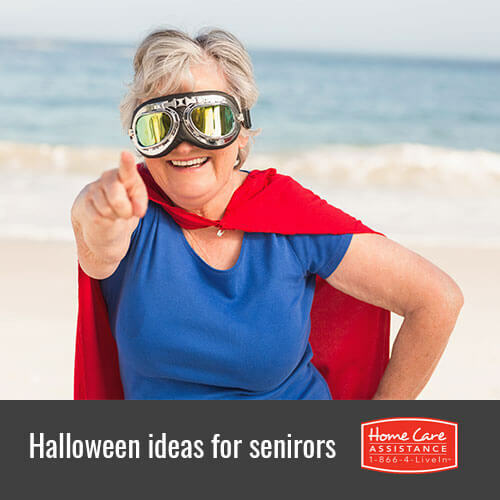 Boost your loved one’s spirits this Halloween and all year round with help from Home Care Assistance. We are the leading provider of both live-in and hourly home care Oshkosh seniors trust to make life at home more manageable without compromising their dignity. Contact us at (920) 710-2273 today to talk to an experienced Care Manager about our comprehensive in-home services.